New data from the Alberta clubroot disease survey indicates some forms of clubroot resistance are no longer functioning well against a possible new clubroot pathotype in the Edmonton region. Dr. Stephen Strelkov at the University of Alberta has investigated samples collected from several fields and verified higher levels of infection than expected in some clubroot resistant varieties. Further studies are underway to verify the true virulence of these clubroot strains. This risk was highlighted when clubroot resistance was first introduced in Western Canada in 2009. Researchers from Sweden had earlier observed that the clubroot pathogen overcame resistance in two crop rotations. Clubroot resistance in winter canola in the U.K. was overcome in four years. And greenhouse studies at the University of Alberta showed that some types of Canadian clubroot resistance can lose their effectiveness in as few as two canola crop rotations when under extreme pressure. For these fields in the Edmonton area, it’s like we’re back to 2003 and clubroot has been identified for the first time. Our advantage this time is experience. We know that this disease is aggressive and spreads quickly. The good news is that we’re likely talking about very few fields and patches within those fields. 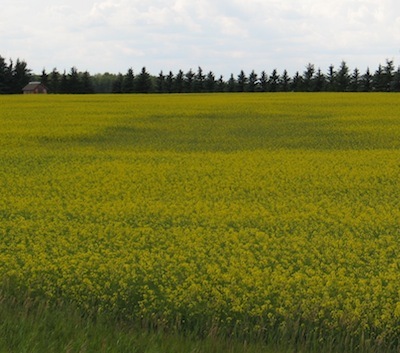 Clubroot resistance is expected to be functional in the vast majority of acres this year. But attention needs to be paid to prevent this situation from expanding. 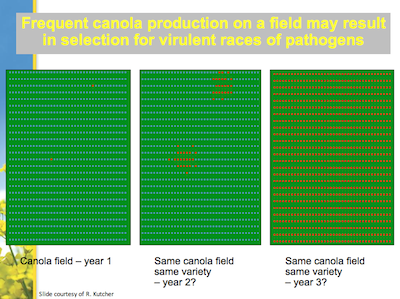 A new virulent pathotype, if allowed to spread, could set us back to the start of a new clubroot infestation. How do new pathotypes develop? 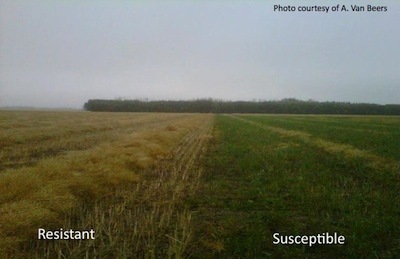 Resistance can lose its effectiveness when repeated cropping of a resistance source selects for individuals within a pathogen population that are virulent on that resistance. Initially, these new pathogen strains are very rare but then increase by being able to attack the “resistant” genotypes. Short of a stacked genetics solution and/or the development of several more distinct sources of resistance, which could take a lot of time and effort, we need to follow the risk mitigation practices to help prevent clubroot spread and protect this valuable genetic trait. EcoNomics. 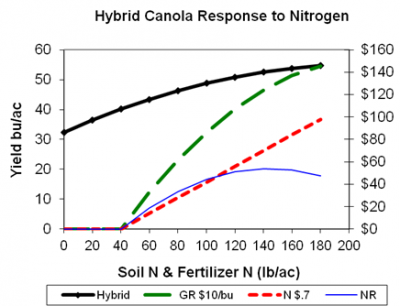 Handy graphs and calculators show the best nitrogen rate based on yield potential and appetite for risk. Is this the year to claw back or keep the pedal down with regard to N rates? Ignorance is not bliss — especially when it comes to clubroot. Early detection and adoption of resistant varieties, rotation and equipment sanitation can keep the economic cost of clubroot low and the R-trait effective for years on a given farm. Top 10. Put your recordkeeping app to work this seeding season, and follow this checklist for your best notes ever! Spring checkin’. Time to check canola bins. As outside temperatures warm up, moisture starts moving around inside bins again. 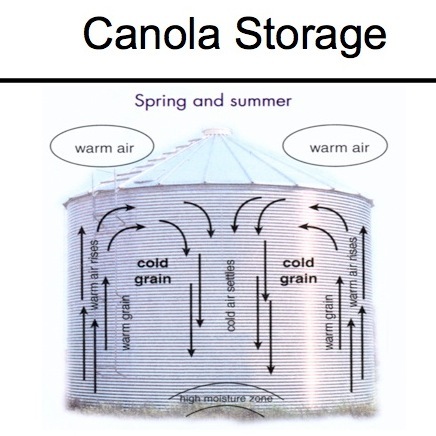 Canola in storage is vulnerable again. Clubroot lowers the bottom line for more and more Western Canada canola growers each year. The disease has been advancing through Alberta at a fairly steady 20 to 25 km per year, and has been detected at low levels in Manitoba and Saskatchewan. All Prairie fields are at risk of economic loss from clubroot, with the highest risk fields those that are (1) in known clubroot areas and (2) whose owners are currently doing very little, if anything, to prevent or manage the disease. 1. Date. Record the date and also the time of day that each crop was seeded. 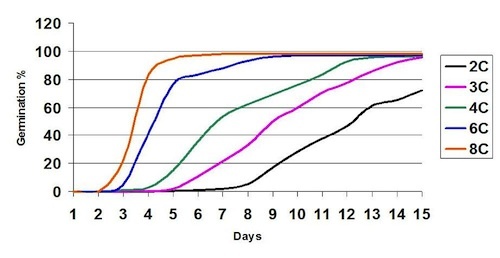 Comparing seeding dates, and cross referencing that with soil temperature and moisture conditions, can help determine future decisions with regard to ideal time of seeding and management steps that could be taken to reduce risks for early seeding. Time of day could be useful when comparing fields seeded the same day. 2. Soil temperature and moisture in the seedbed. Measure the soil temperature in the seed zone. Also note the 7- to 10-day temperature forecast and update your records with actual temperatures through that period. Soil temperatures in the days after seeding have a significant influence on the days to emergence and the uniformity of emergence. (See the graph above that shows emergence rate as it relates to soil temperature.) Recording soil temperature can help when sleuthing potential emergence issues, and can be a useful reference if emergence is very strong. 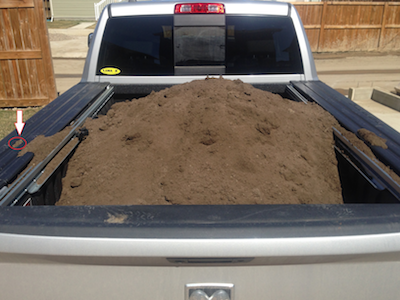 Also note seedbed soil moisture — dry, moist or wet — on seeding day. Need to make a last minute seed decision? 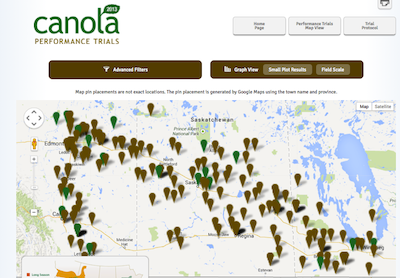 Visit www.canolaperformancetrials.ca for canola variety comparisons for 2013 as well as 2012 and 2011. The online tool has data on yield, days to maturity, lodging and height for small plot and field scale sites across the Prairies. Use the various filters to refine a search by location, herbicide tolerance system, year and season zone. Click here for the 2013 results booklet.